Many Australian banks, faced with new challenges—such as stricter regulations, increasing competition, dwindling margins and evolving customer demands—are beginning to rethink their business models to ensure that they can stay competitive. However, one area that is often overlooked is pricing strategy. A surprisingly large number of banks are reliant on legacy pricing and billing systems that are unable to adequately protect and grow commercial banking revenue streams. In order to offer a high degree of customisation to commercial clients, these banks typically develop products and prices on a case-by-case basis with little tracking of limits or pricing conditions. This ad-hoc approach to pricing results in a range of problems, including a lack of product rationalisation, slow product development, inaccurate billing and inefficient and risky processes. These problems lead ultimately to revenue leakage and increased conduct risk. The solution to these problems, our new report shows, is to use a holistic, centralised and independent pricing and billing system. Such a system would serve as a central repository of all product and service information that can access data from a customer information system, as well as accounts and transaction data from core banking and other product systems. This would give banks the ability to track all relationship-level pricing parameters and quickly and easily make changes to products and pricing to leverage new commercial opportunities and meet new regulatory requirements. It would also allow banks to create more customer-centric propositions and deliver them quickly through digital channels. A surprisingly large number of banks are reliant on legacy pricing and billing systems that are unable to adequately protect and grow commercial banking revenue streams. Some banks, such as Canada-based CIBC, have begun to recognise the importance of adopting a pricing and billing system that is run independently from the core banking platform. CIBC was experiencing problems in managing revenue, rolling out new products and amending fees due to its reliance on a manual billing process. To tackle these problems, the bank set up myClient, a pricing and billing platform powered by Zafin’s miRevenue. The platform includes a centralised product and service catalogue and enables the automation of pricing, billing and analytics. Thanks to myClient, CIBC has been able to launch new products 50 percent faster, make IT cost savings of up to 70 percent annually, identify new revenue opportunities, enhance pricing governance, automate consolidated billing and eliminate the risk of manual billing errors. 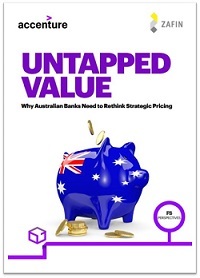 The benefits to Australian banks of adopting a systematic, strategic approach to pricing are clear. Such an approach would help these banks maximise their profitability in the context of stricter regulations and increasing competition. More than that, strategic pricing can help banks improve transparency, as it allows them to issue more detailed invoices. Considering the fact that an August 2017 survey by the Australian Bankers’ Association found that only 31 percent of customers had a positive view of the country’s banking industry, the need for greater transparency is all too apparent.